Mornington Peninsula, Rosebud, Frankston, Hastings, Brighton, Beaumaris, Carrum Downs, Bentleigh East, Rowville, Pakenham, Cranbourne, Glen Waverley, Ringwood, Yarraville, Seddon, Williamstown, Altona, Werribee, Hoppers Crossing, Williams Landing, Point Cook, St Albions, Hillside, Taylor Lakes, Caroline Springs, Craigieburn, Caulfield, Prahan, Port Melbourne, Richmond, Templestowe, Greenvale, Greenborough, Eltham, Newport, Footscray West, Glenroy, Pascoevale, Northcote, Brunswick, Doncaster, Balwyn, Camberwell, Preston, Coburg, Kew, Glen Iris, Springvale, Dandenong, Kilsyth, Reservoir, Epping, Thomastown, Bundoora, Mill Park, Mentone, Cheltenham, South Melbourne, St Kilda, Elwood, Red Hill, Rye, Mitcham, Wheelers Hill, Mulgrace, Hawthorn, Lang Lang, Langwarrin, Narre Warren, Berwick, Lalor, Main Ridge, Merricks, Tooradin. Planning for delivery of your hired toilets. There are some important factors to consider when planning the location of your hired amenities. Toilets, urinals, drinking stations and disabled toilets are all quite large objects and you need to calculate how much space you will need to allow for the safe and comfortable use of and access to these amenities. This is a really important consideration and is sometimes overlooked. When you are working through the list of possible sites to locate your hired amenities, you need to think about adequate access for the vehicles transporting the toilets. This can be a difficult thing to work out especially if this is the first time you have had to deal with hiring amenities for an event. 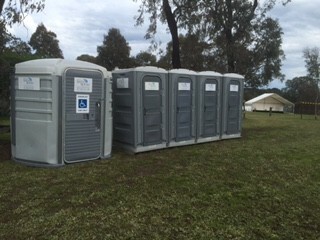 The best thing to do is ring one of professional friendly staff and we will run through the site layout with you, give you the dimensions of the products and vehicles and work out the most convenient and safe site to locate your portable toilet facilities.